When pants sag or a jacket doesn’t button, there’s no question – that suit doesn’t fit. However, there are a few subtler signs that a suit isn’t right for your body type. Let’s look beyond obvious clothing concerns and learn how to tell if a suit fits, so that it looks fabulous to you and onlookers both. After all, you want to stand out in all those formal photos for the right reasons, not for a wardrobe malfunction. The writers at Esquire know a thing or two about looking sharp in a suit. They remind wearers to look for jackets with shoulder pads that end at the edge of the shoulder. If the pads are too big, and round over the curve of the shoulder, you’ll end up looking bulky and out of fashion. No shoulder pads? No problem! The fabric should lie flat with the seam on top of your shoulder where it meets your arm, not over the arm itself or hugging the collarbone. If you notice any ripples or bunching, the jacket isn’t fitting well. Moving down the jacket, when it’s buttoned, you should easily be able to slip a flattened right hand under the lapel and rest it over your heart. If you’re struggling, the jacket is too tight. If you can make a fist comfortably, you likely need a smaller size jacket or it needs to be taken in. Peek at the top button of the jacket. Is it resting above your navel? Perfect! If it falls below, have the jacket tailored to sit higher on the abdomen. When you stand relaxed with your hands at your sides, your knuckles should align with the bottom hem of the jacket. Finally, the jacket’s sleeves should end between the base of your thumb and wrist with 1/4″ to 1/2″ of dress shirt showing, if wearing long sleeves. After fastening the pants, give them a look over. There should be a smooth flow of fabric over your rear end, down to your upper thighs. Bunching, draping, U-shape puckers, or horizontal creases below the round part of the rear mean the pants just don’t fit, according to the Art of Manliness. As you go down the legs of the pants, you may notice a sleek line (slim fit suits) or a wider cut in a more traditional style. Both are fine as long as the fabric lies flat. You don’t want bunching (too long) or clinging (too tight). At the bottom of the pants you will find a hem. When standing, this should rest on the top of your shoe with a slight indent or fold. At the back of the pants, be sure the hem rests above the heel of the shoe. Your socks shouldn’t be visible until you are seated – or showing off wild dance moves. 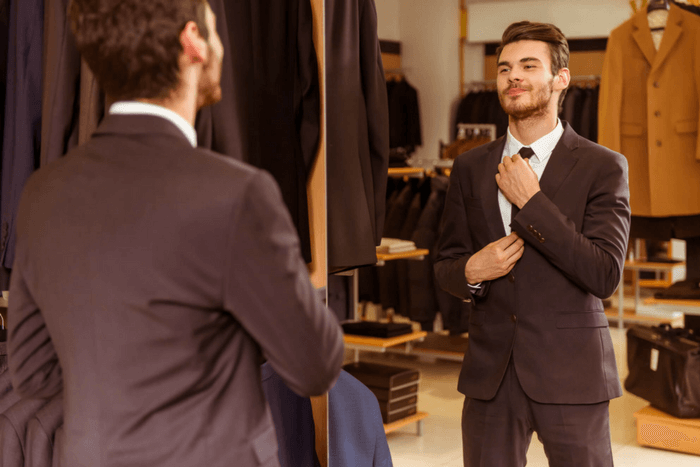 As you figure out how to tell if a suit fits, practice walking, sitting and standing. You might be surprised to find that the jacket feels snug or pants bunch when in one position and not the others. 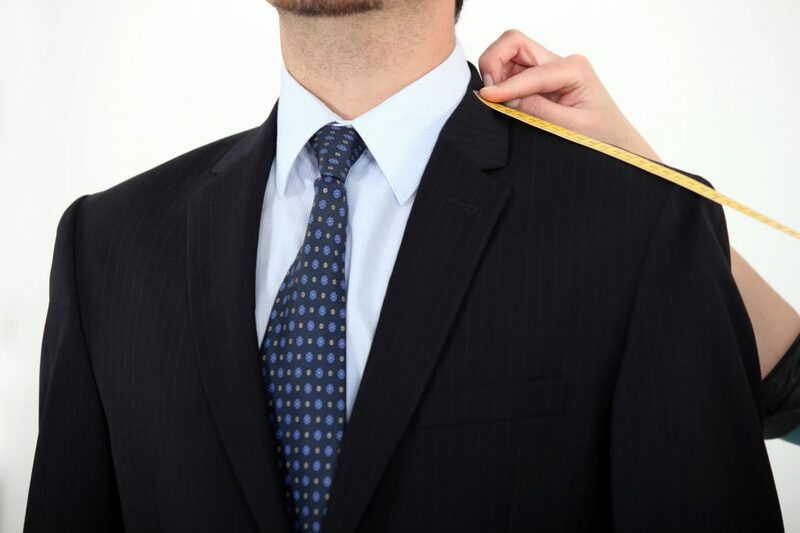 Let your formal wear professional know so they can make adjustments for your comfort. Do you need assistance picking out a suit for a special occasion? Start browsing options at Jim’s Formal Wear today!